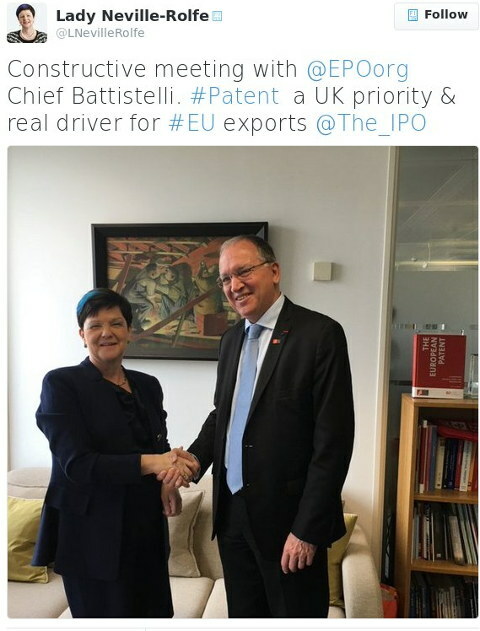 THE EPO discussion has shifted/moved towards ILO, but let’s not forget that Team UPC — a cabal of nefarious people who perpetually pull every single trick they can — work behind the scenes and try to trick politicians into doing nefarious things. It’s a grand example of political corruption, not just lobbying. We’ve covered examples. “It’s a grand example of political corruption, not just lobbying.”There may be another “torpedo” (to use JUVE’s word) on the way — one that can kill the UPC for good. No UPC (or anything like it, even a rebrand) should exist for reasons that we’ve been covering here for nearly a decade. “Yesterday we saw over a dozen tweets from Alex Robinson, a proud member of Team UPC who is referring to himself and others who perform this coup as “Team UPC”.”Guess who were there to take the lead. It was Lucy Neville-Rolfe. Seriously! “Motion agreed unanimously,” he concluded and there’s a lot more there. But UK ratification is not possible and Jo Johnson, who took over Lucy’s job, already said that he’s not in a position to ratify. Robinson isn’t happy about it and Bristows used his words to lie about Johnson’s actual position. No, they are not in a position to ratify for plenty of reasons other than some signatures and it’s dishonest to suggest otherwise. Moreover, complaints may be on the way, just like in Germany. The transcript is too long for us to rebut on a point-by-point basis, but it’s basically a salad of lies. There’s no such court as there’s no UPC. But don’t let reality get in the way. It’s not too convenient. The timetable may simply say that the entire thing is stuck until 2020 if not later. And it will probably never happen.